This is part 6 of a 31-part posting of my journal entries and photos from one of the greatest experiences of my life so far--a month-long mountain climbing trip to the Atacama Desert area of northern Chile and Argentina, which included summiting three 6000 meter peaks (~20,000 feet). To view all the entries in this series, check the posts labeled South America. I spent the night sleeping in my car parked in a pull-out beside the international highway that connects northern Chile and Argentina. For twelve hours through the night no vehicles passed my position. Maybe most of the traffic is commercial, so not active on weekends? I took a while to fall asleep, perhaps an hour and a half, but then I slept really, really well! I woke up a total of 3 or 4 times through the entire night, and then only for a minute at most. I started stirring and was more awake when light developed in the eastern sky, but then slept more, waking up to note the first sun on the adjacent mountains. It was a chilly, calm morning. At 7:30 the sun hit my car and I just sat and monitored the warm-up inside the car. Outside my thermometer read 14 degrees. It warmed up slowly to freezing over an hour and fifteen minutes inside the car. Lots of frost had accumulated on my inside windows, and that took most of the hour to start melting. Meanwhile I made myself a quart bottle of powdered milk and Ovaltine and drank it, then just rested and relaxed. At 9AM I turned on the car briefly and caught up on journaling with the laptop plugged in with my inverter. Then at 9:15 I took a little stroll across the road to the south, enjoying the warming temperature and still calm winds. I returned to the car, deciding that if I want to take a stroll for exercise, the time was now: when the wind is light. I changed and put on sun screen and headed out at 9:40, just minutes after the first car came by--first one since before sunset last night. I hiked from 9:40 to 11:30 in nice conditions at a relaxed pace, only getting up to 15,650 feet. The breeze began to organize about 11AM. Before that it was essentially calm, with slight breezes from different directions. The west wind became steady but still very light after 11, and continued to intensify all through the afternoon, so that it was at its strongest by 6PM. 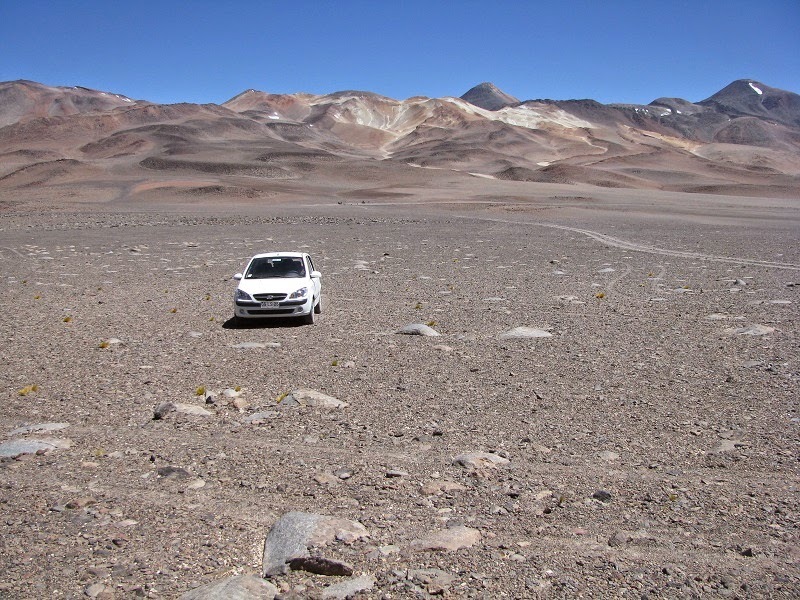 When I got back to the car I changed and at 11:40 I drove back up toward the pass to check out access to the slopes of Cerro San Francisco, the 6020 m mountain south of the pass. At the pass I found a very good quality jeep road that crossed the flats for less than a mile to the base of the mountain. From there the road continued up the slopes and would be a good path to follow for some training. I drove up to the base of the slope and parked. In some ways that side road was smoother and firmer than the highway! It certainly was no trouble for my car. The elevation there was 15,600 feet, so about 100 feet higher than the pass. Up top is a photo of my ‘campsite’ 1.1km from the highway, with the border markers on the highway barely visible a bit above/right of the car. This would be where I would camp for the next three nights. I settled there at noon with the wind still just 10 to 15mph. I reclined my seat and napped and rested until 1:30PM then went out for a little stroll on the flat. The wind was still not bad. And I was surprised to notice insects at this extreme altitude and dry conditions--three different kinds buzzed my car--flies, some kind of big bee, and an even bigger fast moving moth-like thing. Back in the car I started planning my next two days. When I checked my supply of water I realized that I didn't have enough to take two hard hikes. It is critical not to get dehydrated at this altitude--at least for me. As it is, I was feeling fantastic--no headache today and no other symptoms--acclimatizing well. I made a hike list--list of things to be sure to take and do before heading off on my hike tomorrow soon after sunrise--the goal tomorrow is to try to reach 18,000 feet. I began to feel a bit of soreness on the ball of my right foot, so checked it out. I had a big half-inch blister there--not on the bottom of the foot but close enough to it to be a concern. I had worn cotton socks rather than my smooth nylon liner socks and padded hiking socks on both yesterday’s and today’s hikes. It was stupid to wear them, though I could not have predicted they’d make that big a difference. What a horrible time to develop a blister! Well, that changed my plans for tomorrow--just a short hike tomorrow, then hopefully one big one to 18,000 feet on Tuesday, then the water supply should hold up, I hope, and I’ll just leave for the lowlands soon after sunrise on Wednesday. That would change my plans to do some further exploration on Tuesday. I’ll never get back to Laguna Verde for a soak in the hot springs, nor go to the nice Refugio at the base of Barrancas Blancas that was recommended to me. I won’t miss those, though. A good hard training hike and just living at the highest possible altitude were my top priorities for this solo part of the trip. I snacked a little then got out Silmarillion at 4:30 and started reading. I took a break at 5PM and ate the first of two packets of Italian spaghetti sauce--Wow! Did that hit the spot! I should have brought more. From 5:10 to 5:25 I took a little stroll up to a nearby rise, enjoying a slight break in the wind and a still warm air temperature of 63 degrees, and testing out the blister. It isn’t severe, and hadn’t broken. I couldn’t actually feel any sensation from it on the stroll. I returned to reading Silmarillion and read until it got too dim to see. The sun set on my car at 8:25, at which time I got into my sleeping bag. It set on the peaks about ten minutes later, and at 8:50 it was becoming difficult to read, so I fully bundled into my sleeping bag and went to bed.